Today's a big day in Puerto Rico. The musical "Hamilton" is opening tonight, and its creator, Lin-Manuel Miranda, is on the island to reprise the title role during the show's three-week run. His family is from Puerto Rico. And when he announced the production a year ago, Miranda envisioned it as a way to lift people's spirits after the devastation of Hurricane Maria and to raise millions of dollars for arts on the island. But the show's arrival has also brought some controversy. We're joined now by NPR's Adrian Florido, who is in Puerto Rico's capital, San Juan. Hi, Adrian. SHAPIRO: A lot of cities are waiting for Hamilton to arrive. How do people in San Juan feel about its opening there tonight? FLORIDO: Oh, there's a lot of excitement. This is one of the biggest artistic events in recent memory, and there are also a lot of big names expected to attend including more than 30 members of Congress. Speaker Nancy Pelosi, former President Clinton, Oprah Winfrey - they're all expected to attend sometime in the next few weeks. SHAPIRO: Is it crass to ask whether those people visited the island after the devastation of Hurricane Maria? FLORIDO: Yeah, I mean, it's hard to know how many of those did because the list of attendees hasn't been confirmed, but that is a question that a lot of people on the island have been asking. I've actually seen it floating around quite a lot on Twitter today and yesterday. For his part, Lin-Manuel Miranda announced the production soon after the hurricane and also that the money raised from the ticket sales would go to arts organizations here. The Mirandas - Lin-Manuel and his father, Luis, who is running the production - they invested about a million dollars to renovate the theater at the University of Puerto Rico so that it could stage the show. 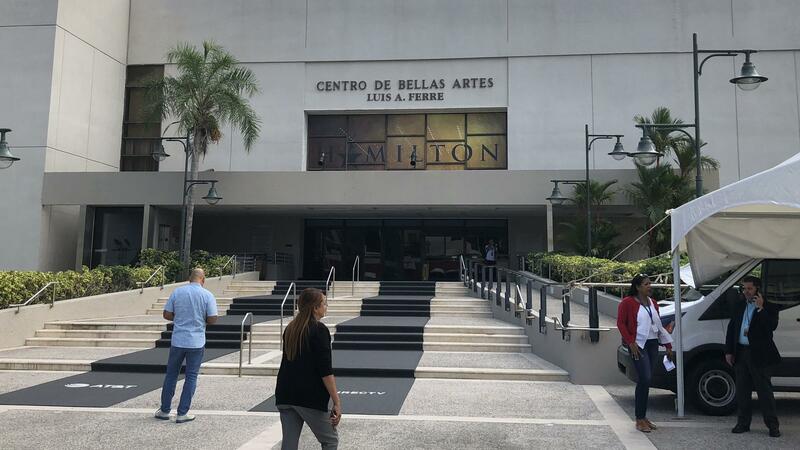 But then a couple of weeks ago amid the threat of protests, the Mirandas abruptly announced that they were going to move the production from the university to the fancy Fine Arts center in San Juan. SHAPIRO: Explain what those protests were about. FLORIDO: Well, as you know, Puerto Rico is in default on more than $70 billion in debt. And a couple of years ago, the U.S. Congress created an oversight board to basically take control of the island's finances and renegotiate this debt. That law was called PROMESA. And both Lin-Manuel and his dad, Luis, supported it at the time. I actually sat down with Luis Miranda yesterday at the theater, and this is what he had to say about that. LUIS MIRANDA: I supported PROMESA. It was the only way that we saw at that point - Lin-Manuel and I and the family and, quite frankly, many others to - make sure that Puerto Rico can restructure the debt. The unintended consequences of that junta that has become a pseudo government, it's something that clearly everyone should be against. FLORIDO: He now says that he opposes what this board is doing, and a lot of people here do. They see it as a kind of colonialism. And the irony that "Hamilton" is a musical about a response to colonialism has not been lost on people here. SHAPIRO: Explain why those protests over that law would lead for the Mirandas to pull the production out of the university theater, where, presumably, it could have done a lot of good for the university financially and move it to this other performance venue. FLORIDO: Yeah. Well, I mean, it's because some of the steepest cuts that are being imposed by this oversight board, they're falling on the University of Puerto Rico. And so recently, a union of university employees threatened to strike over these cuts. And so the Mirandas, they decided they didn't want to risk the possibility of their production being disrupted. SHAPIRO: What are their hopes for what this three-week production accomplishes on the island? FLORIDO: Well, you know, after Hurricane Maria, you know, there's been a lot of progress made in the reconstruction. But there's still a lot of rebuilding left to do. And so what Luis Miranda told me was that he hoped that these visits from all these elected officials will help move that along. MIRANDA: And what I hope will happen is that they will see firsthand what happened to Puerto Rico after Maria, the progress that has been made and everything that still needs to happen to build a island that is more resilient than before Maria. FLORIDO: As in the States, Ari, the tickets for the show have sold out completely. Some of them were really expensive. But the Mirandas are also doing a lottery for 10,000 tickets at $10 a piece, which is a lottery that I think anyone in the States who's trying to get tickets to "Hamilton" is probably very, very familiar with. SHAPIRO: That's NPR's Adrian Florido in San Juan, Puerto Rico. Thanks so much, Adrian. FLORIDO: Thank you, Ari. Transcript provided by NPR, Copyright NPR.